Of all of our successes and customer deliverables over the last 5 years, after our students, we are most proud of our staff and our Kids Digital U tech programs for kids. Kids Digital U has been ranked the #1 STEM program for kids aged 10 – 18 in the Greater Boston area (the most competitive academic market in the United States) for the last 3 years in a row. Students come to our Kids Digital U programs from all over the country and now all over the world. We cannot tell you enough how much we appreciate the feedback over the years. Visit our Facebook page to read the feedback for yourself. These accomplishments and successes did not come easily. In fact it is quite the contrary. We invested years making our curriculum just right. We continually challenged ourselves how to make it better and better. We’re never satisfied. Our tech programs became so popular people asked us if we could build an online version of our Kids Digital U programs. Thus Kids Digital U Online was born. You can find Kids Digital U Online at www.kidsdigitalu.net. At Kids Digital U Online kids learn, for example, 3D design & animation via online tutorials and get access to our enormous digital library. 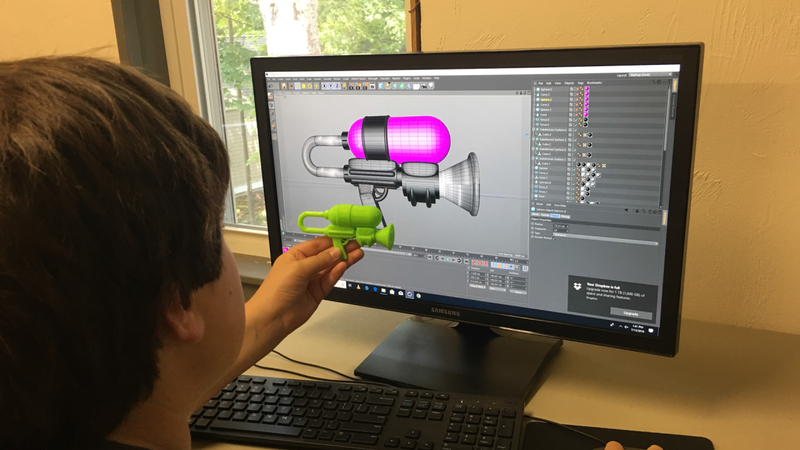 Here a student shows off his custom ray gun made completely by himself from scratch...and printed in our 3D printing lab (the largest of its kind for kids in all of Massachusetts...excluding colleges and universities of course).